Please join the Coalition for African Americans in the Performing Arts (CAAPA) for an evening of delicious food, classical music performed by soprano Pamela Simonson, tenor Keith Craig, and violinist Alex Strachan; paintings by local artist Elaina Wells; and poetry featuring Prince George’s County Poet Laureate Sistah Joy. Click here to get tickets today! In Visible Colors and GHearts present the 14th annual Heritage Film Festival. The festival will take place from May 15th- 18th in New Carrollton, MD. The festival seeks more entries for this year’s event. Interested parties are encouraged to submit their films online at filmfreeway.com/festival/heritagefilmfestival. For more information, please visit www.heritagefilmfestival.org. 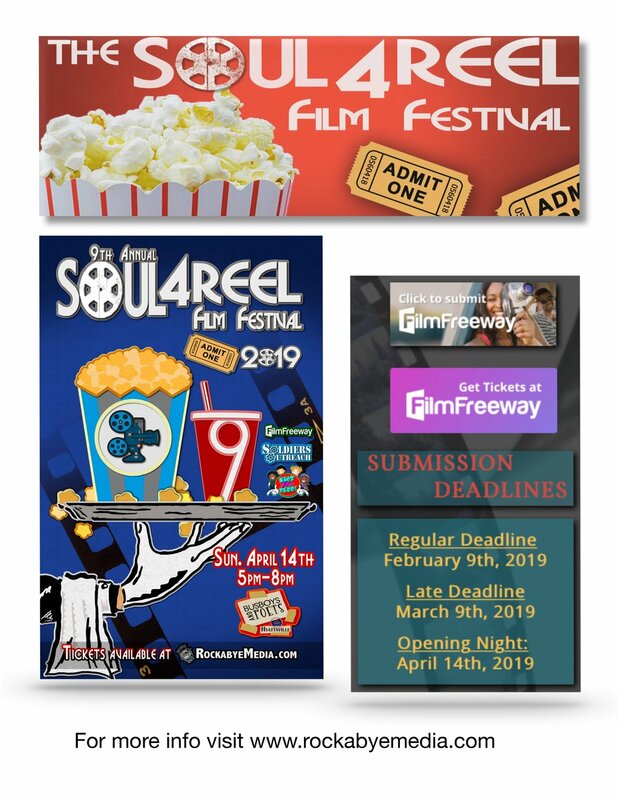 The 9th Annual Soul4Reel Film Festival will take place on Sunday, April 14th from 5pm-8pm. Filmmakers are still able to make submissions through March 9th. Click here to RSVP or submit a film. A special opening reception will be held on April 4th from 6:30pm-8:00pm. Prince George’s Arts and Humanities Council invites you to, ‘A Cuban Cultural Experience’. Join us for Cuban Dance, Arts & Crafts, Community Art and Live Painting! The even will take place from 12pm-2pm at the Beltway Plaza Mall located at 6000 Greenbelt Road, Greenbelt, MD 20770. For information, contact Luther Wright at lwright@pgahc.org. 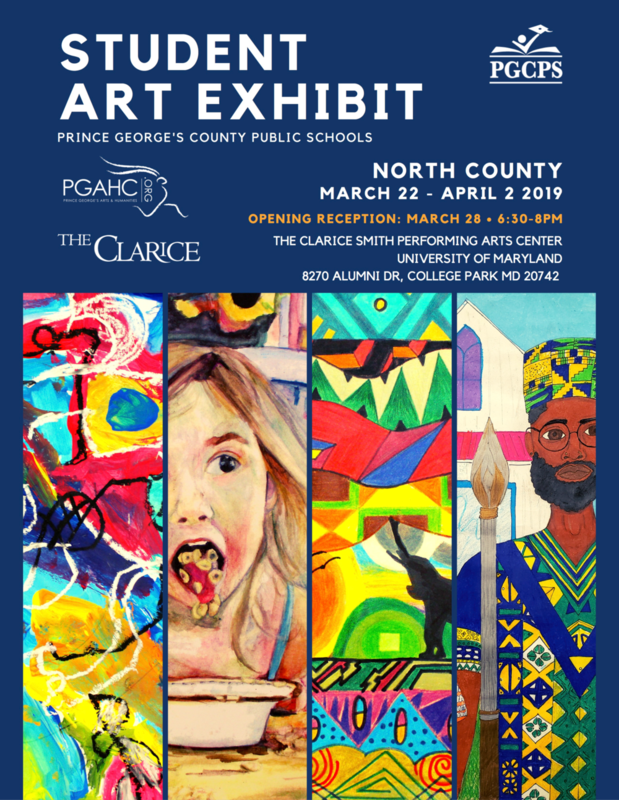 Please join the Prince George’s Arts and Humanities and the Prince George’s County Public Schools for the North County Student Art Exhibit Opening Reception. The event will take place on March 28th from 6:30pm-8:00pm at The Clarice Smith Performing Arts Center at the University of Maryland, 8270 Alumni Drive, College Park, MD 20742. The Prince George’s County Public Schools and the Prince George’s Arts and Humanities Council have partnered to present the Prince George’s County Student Art Exhibit. The North County Exhibit will take place from March 22nd-April 2nd at The Clarice Smith Performing Arts Center at the University of Maryland located at 8270 Alumni Drive in College Park, MD 20742. A special opening reception will be held on March 28th from 6:30pm-8:00pm. The Office of the Poet Laureate is pleased to announce that Hoke Glover, also known as Yao Glover/Brother Yao, will be the Featured Poet at the second event of the Poet Laureate Reading Series. This month's event, which celebrates the rich history of African-Americans, will also feature Youth Poetry Ambassador, Zainab Ahmed, Alto, Christine Jenkins, Djembe Drummer, Doc Powell and Prince George's Poet Laureate Sistah Joy. The M-NCPPC/Prince George’s County Department of Parks and Recreation/Arts and Cultural Heritage Division, Prince George’s Arts and Humanities Council, and University of Maryland University College Arts Program invite artists and other art professionals to a two-day symposium entitled, 'Demystifying Public Art'! Join PGAHC this Saturday, Feb. 9th for the 'I HEART YOU' Card Making Pop-Up. We'll be at the Center Court from 11am-2pm at the Shops at Iverson located at 3737 Branch Ave. in Hillcrest Heights, MD. Contact Luther Wright at lwright@pgahc.org for more info!